We’re rounding the bases and crossing home plate in our consistency ranking series. Tight ends represent the last of skill positions. If this is your first visit you can check out quarterbacks here, running backs here, and wide receivers here. Or, if you prefer to immerse yourself with all of the above and enjoy sortable statics, feel free to nerd out here. We’ll treat tight ends like we have with all the other skill positions: by ranking them from most valuable to least valuable, as per their season long averages. Next, we’ll satiate our data-starved analysis by focusing on how these same players ranked according to value expectations. But first, a word on value expectations. A question came up as to why all players have a negative value. The answer quite simply comes down to average of sample size. It would be impossible for any player to maintain a positive average actual value (notated as Ave AV) over the course of several games. Performance will always dictate future pricing. 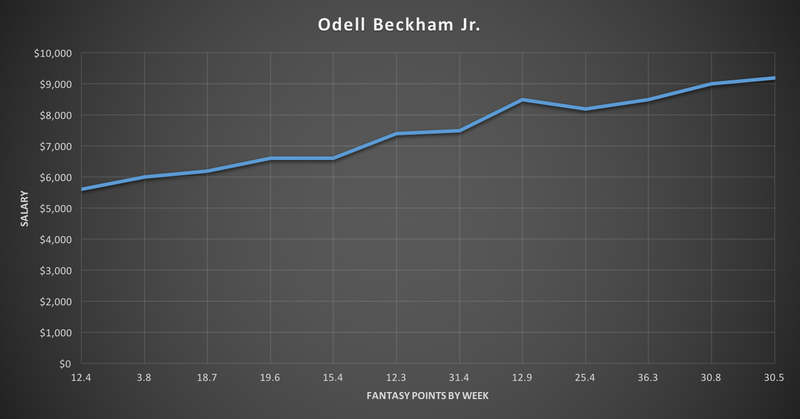 So even if a player did the impossible—continually score more fantasy points from one week to the next—his salary would continually increase from one week to the next. The market corrects itself. There’s a steady increase in pricing that follows performance. 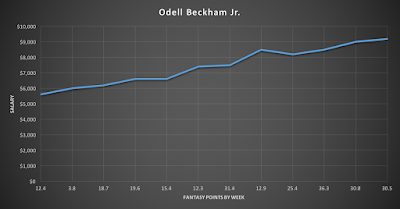 Yet, Beckham finished with an Ave AV of -.25 (second overall). But he did have five weeks where his actual value returned a positive number (and averaged 30.88 points during that timeframe). All this is to say that a negative number isn’t bad. It’s expected. We’re simply trying to measure the distance from zero and adjust our expectations accordingly. For tight ends, that distance appears to be drastic. Admittedly, the Ave AV metric favors mid-priced options. Mid-priced is high wage for tight ends. But the good news is that this metric is normalized to positions. So it doesn’t matter if we see a big difference between the fifth ranked tight end (Antonio Gates, -1.58) and the fifth ranked wide receiver (Dez Bryant, -.51). It only matters that we see a big difference between the fifth ranked tight end versus the first ranked tight end. Throw a flex spot into the discussion and we’d have to rethink our process. In the FanDuel format, it’s of no concern. There’s Rob Gronkowski and then there’s everyone else. That’s your ground floor analysis when it comes to tight ends. It’s also what clouds DFS strategy. Just how valuable are top-priced options? Pay up or pass? It’s no surprise that Gronkowski ranked as the most valuable. His combination of safety and upside provides a weekly bubble that’s easy to transcribe as a no-brainer pick. He also had the highest average salary. But what if we contradict an early statement that said it doesn’t matter how valuable a tight end is compared other positions? Gronkowski is, without a doubt, the best in his line of work. And it’s not close. Yet, of the 17 DFSers that won last year's NFL Sunday Million, only one of them had him in their lineups. In fact, of the 344 lineups that finished in the top-20, he was in only 44 of them—12.8%, which is not a big number given the sample size. If you read the Cracking FanDuel eBook, you know that the top 20 lineups mentioned above spent an average of $6,200 on a tight end, which places them somewhere between Greg Olsen and Delanie Walker per our Ave AV rankings. What this tells us is that tight ends aren’t as valuable as, say, a top wide receiver. So saving money at this position to bulk up elsewhere is the optimal strategy. Looking forward, what follows is a list of the 20 highest priced tight ends for Week 1. This list doesn’t include Gronkowski or Heath Miller since, as of this writing, Thursday night salaries haven’t been released. Not that anyone of you had your eyes on Julius Thomas, but just to be sure, he’s out for a month or more. Be certain he’s not in your lineups. If we’re going to stay true to the $6,200 average described above, it’s hard not to love Martellus Bennett. He was the third most consistent tight end by value in 2014 and ranked sixth in Ave AV. The temptation is to fade the Bears offense more often than not, but opening the season at home against the Packers with a 50-point over/under suggests we should be more confident. Greg Olsen exemplifies opportunity. The loss of Kelvin Benjamin sets the tight end up for more targets than usual, which says a lot considering he ranked third among all tight ends in that category last year with 123. It’s safe to say he’ll enjoy the natural distribution of what was Benjamin’s 145 targets. The only thing standing in his way is an ugly game script against the Jaguars, which is quite likely. Dropping a few tiers, we find a pair of tight ends--new to their respective offenses--that can finally benefit from adequate quarterback play. Should there be any truth to Peyton Manning’s declining arm strength, Owen Daniels is in line to soak up a profitable amount of targets. He’s no Dallas Clark but he’s a better option than Virgil Green (maybe). Reuniting with Gary Kubiak isn’t such a terrible thing either. If you drafted Cameron in your redraft be proud and excited. The Dolphins offense is going to be a major asset in fantasy this year, especially when we can pick our spots like we do with DFS. We’ll close with reminding you that if you’re looking for an edge playing FanDuel, start with the Cracking FanDuel eBook. All things, from basic entry level advice to advanced strategy, are covered to help you manage your journey in what will be the biggest year ever for fantasy football. And what’s great is that it’s free with your Footballguys subscription, along with a ton of other invaluable resources. It was the fourth highest value of all players in 2014. Only three tight ends had a value that ranked inside the top-20. After Week 1, Vernon Davis never surpassed 1x value. Martellus Bennett hit 3x value four times and 2x value three times. Rob Gronkowski hit 5.19x value in Week 8, the fourth most for any tight end. He never hit above 2.66x value in any other game. How Much Does Roster Uniqueness Matter?